So I know I don’t work in an office now a days but I did for many years and I know how hard it can be to come up with stylish, work appropriate, outfits. I like to find certain retailers I can count on for specific items, like a go-to that takes some of the stress away when I’m shopping. When it comes to workwear Express is at the top of my list! They always have on trend items that can be styled so many different ways. I get asked a lot to style wear to work outfits and even though I’m definitely a jeans and tee girl I was super excited to put something together for you guys that can be worn different ways! I love how all of their items can be dressed up or down so you can really get your money out of you purchases. It’s been a while since I’ve actually worked in an office so I decided to head into the store to try on all the new items in order to put an outfit together that I would truly wear to work. It had to be comfortable, easy to style as well as versatile. 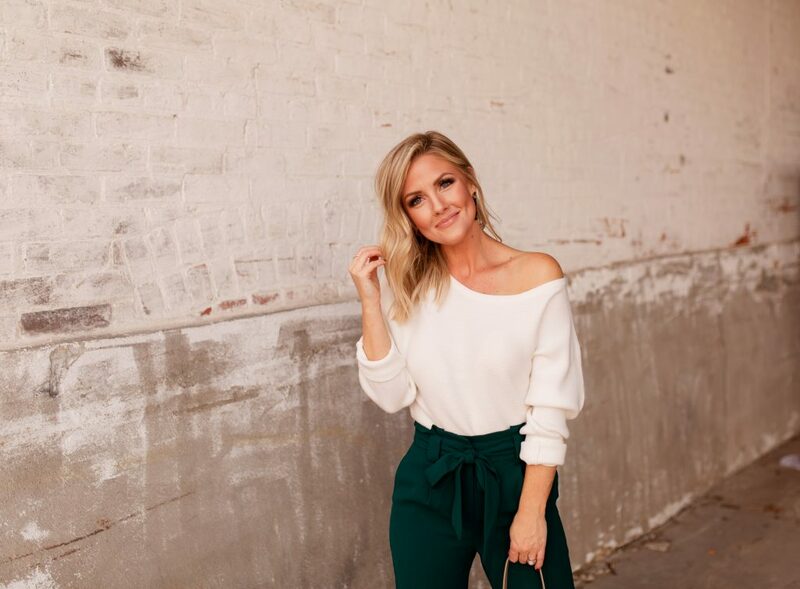 Buying items that you could also pair with dressed down items to wear on the weekends is a huge plus (or these pants with a tee and sandals would be super cute too)! I am a big fan of high waist, belted pants. They are so figure flattering and can easily be dressed up or down, so these were a MUST! They come in SO many different colors including burgundy and black. I LOVE the tapered leg and how they are slimming but not fitted. Definitely comfy enough to wear all day! If you are able to wear denim in the office the Mid Rise Stretch Performance Skinny Jeans are my faves! Fitted but not tight and I love the wash – dark and not distressed which would make them perfectly appropriate for an office environment. Next I decided to go with this ribbed sweater, super simple but a definite wardrobe staple since we are now in fall. I love tucking in a sweater, weather it’s a full tuck or a front tuck, it adds so much to an outfit. Try playing around with different tucks when you’re getting ready, I think you’ll be surprised at how many ways you can wear the same top and make it look completely different. This one in particular is sooo soft, neutral, and the perfect weight to wear in the office (not thin but not too heavy). It also comes in a few different colors and you could easily mix and match it with different pants (or skirts). Last, but certainly not least, I had to check out the accessory section – this part might be my fave! I can never pass up a cute tortoise earring and at this price you will have to have them too! Finally I HAD to have this adorable purse to and these low strappy heels complete the look. Each of these items were under $50! Love me some affordable fashion! *Express has been super generous and is offering my followers a Ring Code for $25 OFF of every $100 you spend (online AND in store)! Use code 5043 at checkout! *Thanks so much to Express for sponsoring this post!